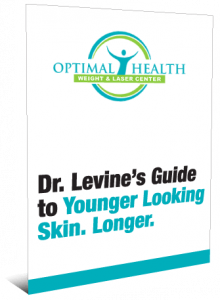 Beautiful skin is no longer a pipe dream for the patients of Dr. Levine. The introduction of her new Laser Genesis and IPL (Intense Pulsed Light) treatments offers cutting edge methods of lightening out dark spots and balancing skin tone. Whether the problem is acne, redness, enlarged pores, hyperpigmentation, vascular lesions, acne scars or age lines, it can be minimized within a few short visits. Treatments are generally painless and produce very few side effects. The skin rejuvenation and stimulation of new cell growth brings on a fresh, youthful appearance. This non-invasive procedure can take care of numerous skin conditions on the face and neck. Its effectiveness against scars makes it a viable remedy for other parts of the body as well. Since it is basic laser technology, no anesthesia is necessary during the treatments. The patient feels only a gentle warmth on the skin and may experience pinkness for up to two hours after each visit. The procedure encourages new skin cells to grow and collagen to be produced. As a result, fine lines gradually disappear while pores shrink and rough skin softens. Small capillaries and veins that are underneath the skin begin to close up and stop causing redness. For acne scars and other blemishes, Laser Genesis works wonders; the fading process becomes very apparent after three or four treatments. Most conditions require about six sessions for optimal results. Maintenance treatments may be scheduled to keep the skin looking healthy for an extended period. The following lifestyle suggestions will help to control acne outbreaks and prevent further skin problems. Skin imperfections, especially in pigmentation and skin tone, can be dramatically reduced through IPL. The procedure is non-invasive and involves very little discomfort. It is ideally for problem skin areas caused by aging and sun damage. This light-based device heats abnormal red and brown pigments and destroys unhealthy blood vessels with thin walls. The skin then rejuvenates itself through natural processes. With improved skin tone, the patient develops a more youthful glow. IPL therapy lightens brown spots and freckles, removes benign pigmented and vascular lesions, and treats rosacea. Treatments can be customized according to skin tone and condition. Although the procedure seldom requires anesthesia, a cooling gel may be necessary for vascular lesion elimination. Otherwise patients may feel a slight pinch or sting from the pulse of light. Within about three weeks after treatment, significant improvements should be evident. Darkened spots should flake off, and redness should go away. Any swelling should disappear a few hours after the procedure. Patients with rosacea often need regular treatments to keep their redness at a minimum.